Our house gave us an unexpected gift on the first day we moved in. With our new keys in hand, we entered the backyard to find the little stone shed there blanketed in roses. We had made the offer on the house in February, when the garden was bare branches. I hadn’t been thinking about roses, but now here we were, with a welcome bouquet climbing up the side of this little building. From that moment on, I was charmed by the humble out-building. I learned later that it had been built by hand, with stone and brick and wood, by a father as a playhouse for his little girl. More than sixty years had passed since it was created, and the foundation has cracked and the paint had peeled, but it was still a lovely space. It seemed a shame for us to store old flower pots and shovels in it, and my own daughter wasn’t interested in it as a playhouse. And so last year we began our project. The kids and I took out all the random things that had found their way into the shed, swept out dirt and cobwebs, and hosed the whole place down. The nice thing about an outdoor space made entirely out of waterproof materials is that a total hose-down is an option! After the space was cleaned out, we began looking around for things that could be used to make our little shed into a sacred space. My only criteria for it was that the items we collected be water proof and nothing that would shatter. The door and windows of the shed are completely open to the elements, and although the eaves of the roof insure that it all stays dry, it is also open to curious animals and children. We decided to name our chapel St. Francis of the Garden, since it was in the yard and St. Francis seemed to be a perfect patron saint for a place that shelters just as many cats as it does people. And so, with a clean space and a new name, we slowly started on our project. By chance one day I happened to be driving by a house with an old dresser lying near the curb in pieces. I stopped and asked the homeowner if it was ok to take it, and got her blessing. I loaded up that old dresser a piece at a time out of the grass and took it home— thrilled to have found the perfect prayer table for an old shed. Since it had obviously spent a day or two piled in the grass, I wasn’t too concerned about it being something too precious to leave outside. It’s a bit scuffed up and peeling—but its perfect for our needs. We cleaned it off, put it together, and installed the dresser as our prayer table. Soon after we got some new dining room chairs to replace a pair that were getting rickety and a bit broken, and instead of trashing the old ones, we placed those in the chapel too. 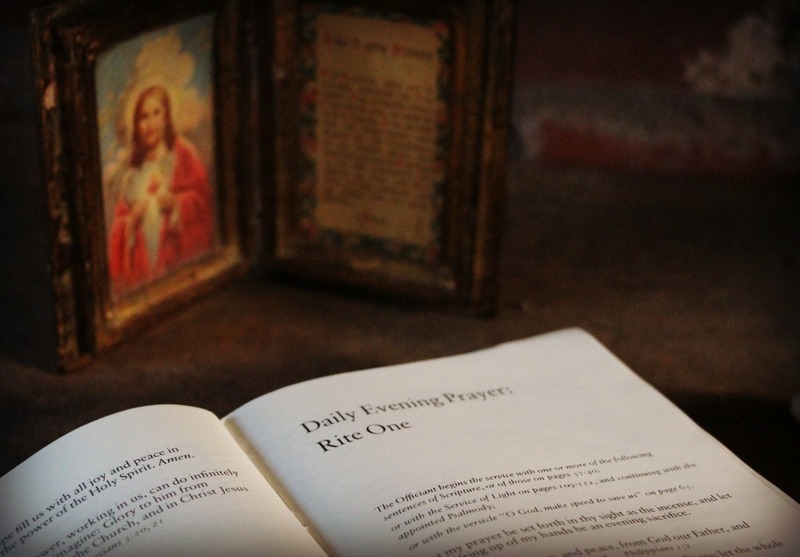 I am so touched by my friends’ generosity and their interest in our humble little chapel— and it is humble. It is old, it is cracked, it has withstood wind, rain, and baking heat. But it is also beautiful. The children and I—and even the animals— love to step into that little space and be enveloped in the calm. We are creating a little cottage garden around it this year too, so that the calm and beauty spills out around it. 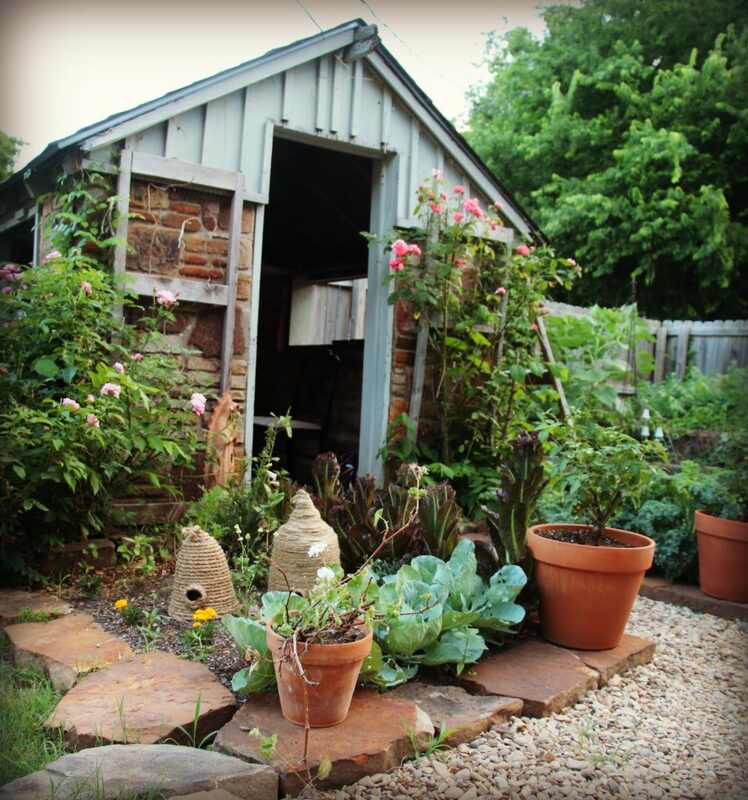 The little garden chapel has become something I love to visit every morning as I’m feeding my animals, often in my bathrobe and crazy just-woke-up hair. Something about have that little space to slip into at any time of the day is so soothing and lovely. And it was nothing we had to build from scratch, and nothing we had to spend a lot of money on. By and large, everything in there was something we already had, we found, or were given. I’ve been encouraging the children to gather interesting items they find through the year, such as pretty flowers, autumn leaves, or acorns and berries, to arrange on the prayer table. 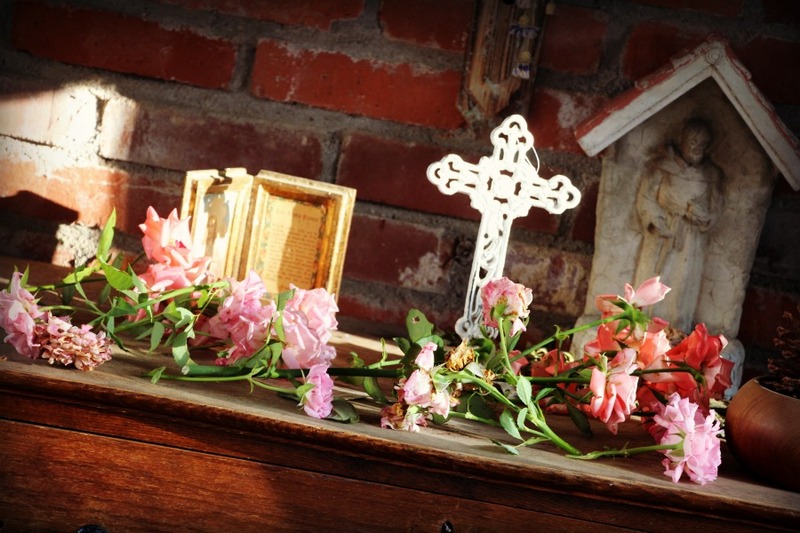 Suddenly little activities such as an evening walk or clipping the roses becomes a chance for an impromptu procession to lay beautiful things in our sacred space. My hope is as they grow, this will become a space they can use to calm their hearts and find peace. It continues to surprise me how much joy we’ve gotten out of what is, essentially, an old shed! It’s my hope to have the space blessed by our priest, the final seal of chapel-approval for our little backyard project. What sacred spaces have you established in your home? This is such a lovely use of this space! What a marvelous idea. Communing with God anywhere is special.